A police officer looking for a woman who might have witnessed a suspected copper thief's fatal fall from a utility pole Tuesday found her yesterday and stumbled upon a suspected stolen-copper processing operation. The woman was with two men who were stripping copper wire at the Nimitz Highway/H-1 freeway viaduct interchange near Keehi Lagoon Beach Park. Police recovered less than a pound of copper wire amid a pile of stripped insulation. They also recovered a mo-ped, some bicycles and power tools. Police arrested the trio on drug charges. Kalihi police Sgt. David Yomes was not scheduled to start his shift until 2 p.m. yesterday, but he went to work early hoping to find a witness to the death of a suspected copper thief who fell from a 40-foot utility pole Tuesday. From the descriptions of the woman who called for an ambulance for the fallen man, Yomes believed he knew who she was and where she hung out. He found the woman under an offramp at the interchange between Nimitz Highway and the H-1 freeway viaduct near Keehi Lagoon Beach Park. "With her were two males who were actively stripping copper (wires)," said Capt. Moana Heu, Yomes' supervisor at the Honolulu Police Department's Kalihi Station. Yomes arrested the woman, 46, of no local address; a Kapalama man, 26; and a Palama man, 37, for drug and drug paraphernalia possession. The Palama man was also arrested on three contempt warrants. 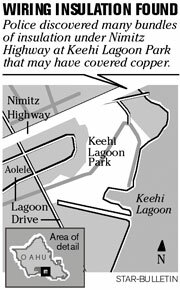 None was arrested for copper theft "because we can't necessarily arrest somebody for stripping copper," Heu said. Police recovered less than a pound of copper wire, about a 3-foot-long section coiled up. They also seized a mo-ped, some bicycles and power tools -- anything whose ownership could be established through serial numbers or other means. 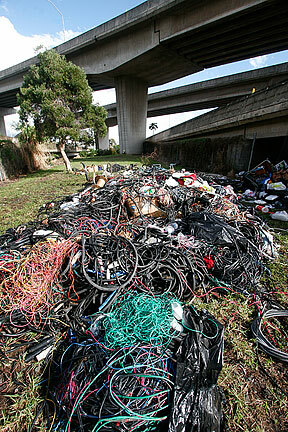 They left some bicycle tires and a pile of stripped wire insulation. Police believe the death of Taily Corpuz, 54, of Waipahu on Tuesday was probably accidental. But they wanted to talk to the woman to determine whether Corpuz died under suspicious circumstances. His body had been moved about 300 yards from where police believe he fell. They suspect his companions moved him to try to get help for him. Police found the utility pole from which they believe Corpuz fell in a construction area in Navy housing near Honolulu Airport. The contractor called police to report the theft of copper wire from the pole. Police believe Corpuz grabbed a live wire, was shocked and fell to the ground. The Honolulu Medical Examiner said Corpuz died from the fall.